The department has close to 25 members. There is a strong research focus and we pride ourselves on the impact of our research. Our dynamic research program covers a wide range of sociological and interdisciplinary research. We offer a wide variety of courses in such areas as culture, deviance, education, family, gender, ethnic and race relations, health and health care, media, methods, occupations, organizations, theory, sexualities, social inequality, technologies, and work. A graduate experience that fosters close mentorship with faculty members who are leading scholars in the fields of Gender, Sexuality and Family; Political Sociology, Social Movements and Policy; Race, Ethnicity, and Immigration; Social Inequality; Social Psychology; and Sociology of Work and Occupations. Discover the Department of Sociology. We are one of the largest departments on campus. The outstanding quality and diversity of our department is one of our greatest strengths. The Sociology Department welcomes Dr. Emily Laxer from Glendon College, York University, who will give a talk based on her new book, Unveiling the Nation: The Politics of Secularism in France and Quebec. The talk is scheduled for 3pm on Wednesday, April 24, in L.R. Wilson 1003. In the wake of the U.S. university admissions scandal, Neil McLaughlin reflects on the differences in access to universities in Canada and the United States. Outstanding teaching performance of sociology professor Jessica Braimoh recognized at the annual MSU Teaching Awards. Sociology is the study of individuals and groups in patterned behaviors. We study social processes and social institutions in areas such as the family, education, health, social inequality, immigration and race and ethnic relations, paid and unpaid work and politics. The goal of sociology is to help explain the relationship between our personal experiences and the wider organization of society. Sociology is the study of individuals and groups in patterned behaviours. We study social processes and social institutions in areas such as the family, education, health, social inequality, immigration and race and ethnic relations, paid and unpaid work and politics. The goal of sociology is to help explain the relationship between our personal experiences and the wider organization of society. 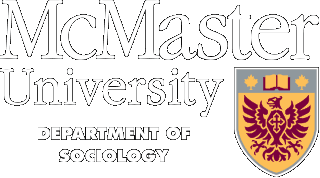 The Department of Sociology at McMaster University offers a graduate experience that fosters close mentorship with faculty members who are leading scholars in our six areas of specialty. The program emphasizes the importance of good scholarship and trains students in current developments in the field of Sociology in Canada and internationally.